NBMonitor tracks your internet bandwidth (upload and downloads) usage, monitors all your Internet, it shows all the active connections you have to the Internet at any given moment and also the volume of traffic flowing through them. 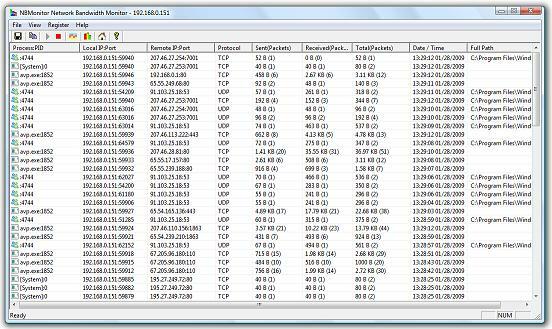 NBMonitor displays real-time details about your network connections and network adapter's bandwidth usage. Unlike others, it shows process names initiated network connections and allows you to set filters to capture only the traffic you are interested in. As a number of ISP's are now disconnecting customers for using "too much" bandwidth, knowing exactly how much you?ve downloaded or uploaded in a given month can be very helpful. NBMonitor monitors and analyzes the network traffic and displays statistical information pertaining to each IP address pair and protocol, helping network administrators and users troubleshoot network problems. The main purpose of NBMonitor is to allow you to collect statistical information about your network traffic that passes through network adapters and display incoming, outgoing and summary traffic statistics. This information is useful, especially for understanding the different IP addresses and data amounts involved with a given network utilizing task. The tool is designed with a user-friendly interface and is easy to use. SYVIR OPTICAL enumerates optical network drives on a LAN. SyvirBuild 2 comes with an automatic network scanner. SYVIR HD returns diagnostic health status of physical drives and logical drives.